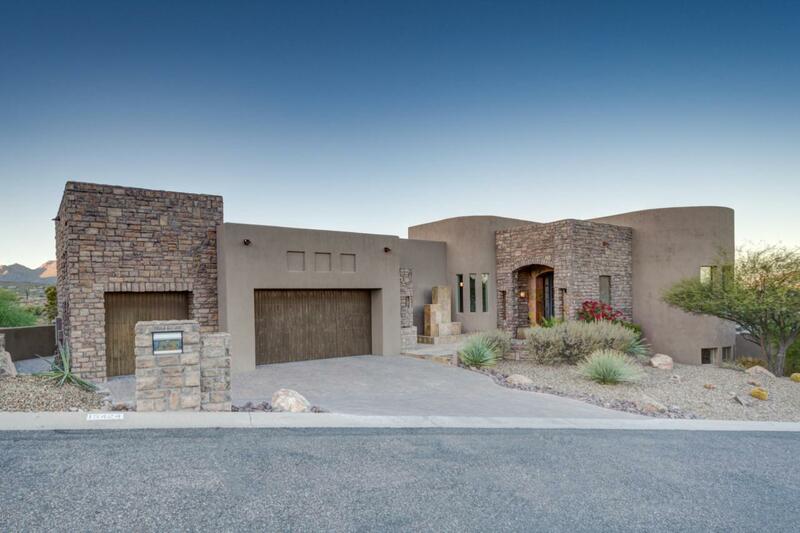 Spectacular Modern/Tuscan Fusion w/stunning views & private resort style living. Grand courtyard entry, slate tiling w/water feature. Enter through custom iron door w/hinged glass panels into living/great room, large frameless glass window w/incredible mountain views, Italian marble fireplace, porcelain tile throughout, marble trim & counter. A Chef's dream kitchen has Adler cabinetry, Wolf, Sub-Zero, Miele and Asko high end appliances and custom granite counter top & island. The master has fireplace, walk-ins and custom shower/faucets. Second master/casita has separate ent. Custom outdoor resort patio w/full kitchen/cooking, Travertine deck, htd infinity pool/spa w/fire/water, rooftop Saltillo deck w/seating. Add theater, bedrooms, sport room & sport court dwnstrs...luxury at every turn!